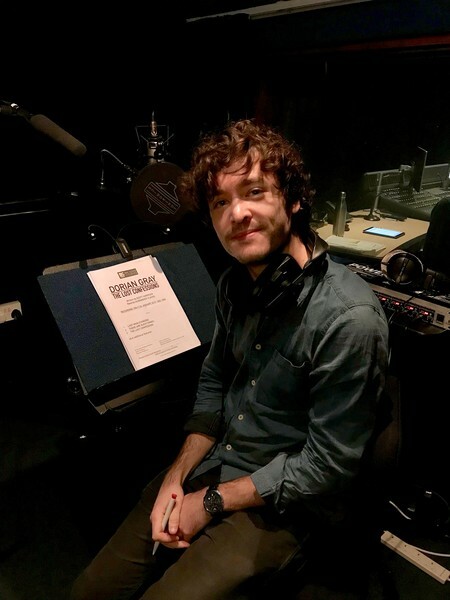 Alexander Vlahos (Versailles, Merlin) returns to Big Finish in a brand new set of The Confessions of Dorian Gray. Due for release in August, three more adventures in Dorian Gray's colourful life will be unearthed in The Lost Confessions. Inspired by Oscar Wilde's classic story of hedonism and corruption, The Confessions of Dorian Gray imagines a world where Dorian Gray was real and his friendship with Oscar Wilde spawned the notorious novel. Five series were created from 2012 onwards, wrapping up in series five back in 2016. And now Dorian is back! After being dispatched on a top-secret mission with his comrade, Jonathan Roberts, Captain Gray finds himself lost in the wastes of No Man’s Land searching for a concealed German outpost. As both men venture further from the trenches, they soon discover forces greater than king and country. Father Victor Merriman is confused when a bedraggled young man locks him inside his own church on a dark and stormy night. The man claims not to be locking them in, but rather to be locking something out: something that has haunted Dorian Gray for over a year now, ever since the engagement of Milly Lloyd. Since his experience at the Brigadoon Hotel, Dorian Gray struggles to come to terms with having a soul; and worse, having lost his soulmate. Travelling the world, he hopes to lay some demons to rest… and perhaps even confront the biggest one of all? This release also includes a bonus 15-minute interview with Alexander Vlahos and Scott Handcock, and an audio commentary for The Confessions of Dorian Gray: The Heart That Lives Alone. Scott Handcock, producer and director of The Confessions of Dorian Gray, told us about bringing Dorian back for this new release, "When Alex and I wrapped up The Confessions of Dorian Gray, we said the story had ended... and it had. However, fast forward a couple of years, and we remembered some unused scripts we’d never made: two from before Big Finish commissioned the series, and the unused finale to series five. Dorian Gray: The Lost Confessions will be released in August on download at £9.99 from the Big Finish website. Each download purchase unlocks a copy in the Big Finish app upon release. If you’re new to the world of Dorian Gray, there are several stories available for FREE here (https://www.bigfinish.com/ranges/released/the-confessions-of-dorian-gray), as well as the five full-cast series of The Confessions of Dorian Gray. And if you’re looking for the classic tale, The Picture of Dorian Gray by Oscar Wilde, you must listen to Big Finish’s adaptation dramatised for audio by David Llewellyn. This release stars Alexander Vlahos, Miles Richardson and Marcus Hutton amongst the cast. Plus you can also try a FREE ten-minute extract from the first Dorian Gray story, This World Our Hell, right here.